Natural gas vehicles (NGVs) look like any other vehicle. The difference is that NGVs operate on natural gas as opposed to the fuel we typically pump into our vehicles’ tanks. NGVs typically use one of two varieties of natural gas: compressed natural gas (CNG) or liquefied natural gas (LNG). Dedicated NGVs are equipped to run exclusively on natural gas. Bi-fuel NGVs can run on either natural gas or gasoline. Dual-fuel vehicles run on natural gas and use diesel for ignition assistance. Basically anyone who’s looking to reduce fuel costs and lower emissions. While increasing numbers of environmentally sensitive consumers are purchasing NGVs, the largest market currently for these types of vehicles are fleets. In fact, 40% of buses on order are natural gas vehicles. You’ll also find NGVs among many other types of fleets, including taxi fleets, courier and delivery fleets, government and police fleets, community fleets, and trades and commercial fleets. Consumers and fleets also have the option of converting existing light- or heavy-duty gasoline or diesel vehicles to natural gas using certified installers. NGVs are as safe as any gasoline-powered vehicle. There are over 11 million NGVs in use around the world, and the safety record is excellent. NGVs in the United States meet the same safety standards as gasoline and diesel vehicles and their fuel tanks are strong and puncture resistant. How much do NGVs cost? NGVs received some of the highest rankings for environmental performance. Using natural gas is one of the best ways to reduce harmful air pollutants. That’s because natural gas burns cleaner than gasoline and other alternative fuels, reducing tailpipe emissions by up to 95%. In addition, factory-built NGVs produce emission levels lower than any other fuel except hydrogen. In fact, the Environmental Protection Agency (EPA) has noted natural gas version of the Honda Civic, the GX, as being the “cleanest internal combustion vehicle on Earth”. Is it easy to fuel an NGV? Yes. CNG vehicles are fueled with easy-to-use, pressure-sealed dispensers. 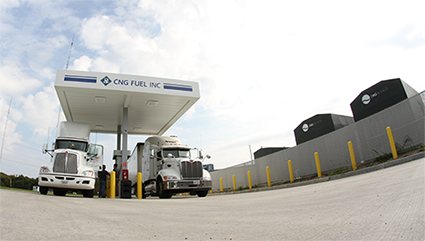 CNG fueling stations can be configured to fuel vehicles at various rates. Time-fill stations fuel parked vehicles overnight, taking advantage of off-peak electricity rates and smaller compression equipment. Fast-fill stations fill vehicles rapidly using larger compression equipment and high-pressure gas-storage systems. To find natural gas station locations, visit the Alternative Fueling Station Locator atwww.afdc.energy.gov/stations.